Can't make it to Del Mar race track? Watch and wager on the races from Del Mar with OffTrackBetting.com. All wagers made through OTB online are directly commingled into racetrack pools, so you can play all of your favorite bet types with confidence, knowing that you'll receive full track odds on all wagers made with us. And with free, high-quality video, you can watch the races online or with your mobile device. OffTrackBetting.com is US-based and legal and licensed, and we promise you superior customer service and the best online wagering experience in the industry. Can't make it to Saratoga Race Course? Watch and wager on the races from Saratoga with OffTrackBetting.com. All wagers made through OTB online are directly commingled into racetrack pools, so you can play all of your favorite bet types with confidence, knowing that you'll receive full track odds on all wagers made with us. And with free, high-quality video, you can watch the races online or with your mobile device. 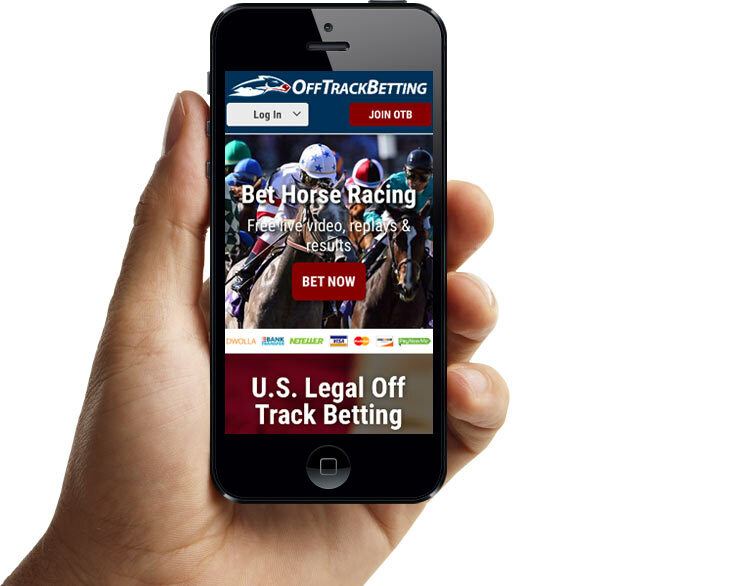 OffTrackBetting.com is US-based and legal and licensed, and we promise you superior customer service and the best online wagering experience in the industry. Parx Racing in Bensalem, Pennsylvania will play host to the Grade 3 Parx Dash Handicap on Saturday, July 12. Horses three years old and upward will be featured as they go just five furlongs on Parx's turf track searching for the winner's share of the $200,000 purse. Parx Racing in Bensalem, Pennsylvania will host the Grade 3 Dr. James Penny Memorial Handicap this Tuesday, July 8. Fillies and mares three years old and upward will take to Parx's turf track and go 1 1/16 miles looking for the winner's share of the $200,000 purse. Monmouth Park in Oceanside, New Jersey will play host to the Grade 1 United Nations Stakes on Sunday, July 6. Horses three years old and upward will take to Monmouth Park's turf track and go 1 3/8 miles searching for the winner's share of the $500,000 purse. Woodbine in Toronto, Ontario will play host to the Grade 2 Dance Smartly Stakes on Queen's Plate Sunday, July 6. Fillies and mares three years old and upward will be featured as they go 1 1/8 miles on Woodbine Racetrack's turf track for a purse of $200,000. The richest and most prestigious race on Canadian soil - the 155th edition of the Queen's Plate Stakes goes down Sunday, July 6 at Woodbine Racetrack in Toronto Ontario. The first leg in Canada's Triple Crown features three years olds willing to go 1 1/4 miles on Woodbine's All Weather track for a nice purse of $1 million. Los Alamitos Race Course in Los Alamitos, California will be the scene of the inaugural Grade 2 Los Alamitos Derby, formerly the Swaps Stakes at Hollywood Park on Saturday, July 5. A nice purse of $500,000 will be on the line for three year olds willing to go 1 1/8 miles on Los Alamitos's main track. The Grade 2 Delaware Oaks is on tap for Delaware Park in Wilmington, Delaware on Saturday, July 5. Three year old fillies will take to Delaware Park's main track and go 1 1/16 miles as they chase the winner's share of the $300,000 purse. Belmont Park in Elmont, New York will be the scene of the Grade 1 Belmont Derby Invitational, formerly the Jamaica Handicap on Saturday, July 5. A group of three year olds will take to Belmont Park's turf track and go 1 1/4 miles searching for the winner's share of the handsome $1.25 million purse.